Illegal activities, such as poaching of wild animals, are common worldwide and threaten biological diversity. Overexploitation is one of the main drivers of bird extinctions globally, and is the second most significant threat (after habitat loss) to migratory birds. Killed or trapped in huge numbers, some species are being driven to extinction. According to a recent study published by BirdLife International, it is estimated that around 25 million birds are being killed every year during their regular crossing of the Mediterranean Sea. These are primarly songbirds that breed in continental Europe and migrate towards their wintering grounds south of the Sahara, but also birds of prey and some waterbirds. Illegal bird hunting takes place by the shoreline in most areas along the Mediterranean coast, using a variety of techniques. The focus of attention has recently been on Egypt, the country where the incredible extent of the netting was revealed a couple of years ago. Over several decades, the hunting of migratory birds has taken different forms along the entire Egyptian and Libyan coast, culminating in recent years in the widespread use of hundreds of kilometres of mist nets during the autumn migration. Bird crime is part of the bigger picture of wildlife crime which is affecting charismatic species such as elephant and rhino which are poached for their tusks and horns. For birds, illegal calling devices are used along the coast of the Mediterranean, but the main methods to kill birds are shooting, netting and gluing. According to BirdLife International, birds are taken for use as pets or display (37 per cent of all bird species), or hunted for food (14 per cent) and sport (4 per cent). Birds are also illegally trapped for falconry or to be sold to restaurants which offer them as a delicacy. The vast majority of birds traded are songbirds, including finches, pipits and larks which are sold in local markets or smuggled abroad either alive or dead. Birds of prey, particularly falcons are mostly sold on the Arabian Gulf market. A large proportion of trapped birds for these purposes do not survive the smuggling chain or die in captivity. Shooting is the most widespread practice for hunting in the Mediterranean region, allowed by law in most countries, with a few exceptions where complete hunting bans are in place. Trapping is allowed in four countries (Egypt, France, Malta and Spain) and falconry is also legal in six countries (Croatia, Georgia, Slovenia, Tunisia, Spain and Turkey). Taking of eggs and/or chicks is mainly prohibited, except in Tunisia where each year four young Peregrine falcons can be legally taken by members of the Falconers Association in El Haouaria from the nest with a specific administrative authorization. Hunting seasons are well defined in most cases, with an open season during the post breeding period for migratory birds (ranging from August to March in most countries). But in some countries, hunting of migratory birds coincides with spring migration and the breeding season. A derogation to the EU Birds Directive allows spring hunting in Malta for Common Quail (Coturnix coturnix) and European Turtle-Dove (Streptopelia turtur) – the latter being currently considered as Vulnerable in the IUCN Red List. Many other species may be affected by this activity including breeding birds. In Bosnia-Herzegovina, Macedonia and Serbia, hunting seasons are not always well defined in the legislation and some species can potentially be hunted all year round, even if it is stated in the legislation that hunting during the breeding period is prohibited. Formerly a marginal threat, wildlife crime today has become one of the largest transnational organized illicit activities alongside trafficking in drugs, arms and human beings. This profitable, well organized, environmental crime has devastating effects on birds and the whole of biodiversity. When it comes to bird crime in particular, there are many reasons for the proliferation of this activity: the lack of expertise and commitment within the controlling authorities, the widespread corruption related to the management of hunting grounds and game animals, the lack of recognition of bird crime as a serious issue, but also the lack of knowledge and awareness on environmental law among public prosecutors and judges. Sanctions imposed for wildlife offenses, particularly the sometimes derisory fines imposed, vary significantly from State to State. Environmental crime is regarded as less serious than traditional crime and judges have often insufficient sentencing experience in environmental crime cases. Despite obligations under the international agreements at the national level, and despite the existence of national legislation, violations continue and enforcement of laws has become an increasingly difficult task due to lack of capacity and awareness of the potential impacts. If the illegal killing and taking of birds are known to be a growing issue of concern, especially across the Mediterranean, there is little quantitative information available. As this threat may be having a negative impact on the populations of some bird species, an assessment is needed to estimate how many individuals are being killed illegally each year, which species are the most affected and where the worst locations are. An assessment undertaken by BirdLife International has highlighted the paucity of data on illegal killing and taking of birds in the Mediterranean region and the need to establish standardized monitoring. This will help stakeholders prioritize conservation actions to address this international conservation problem. Large numbers of birds are also hunted legally in the region, but specific numbers are generally unavailable. Such data are needed in order to assess the sustainability of exploitation of birds. 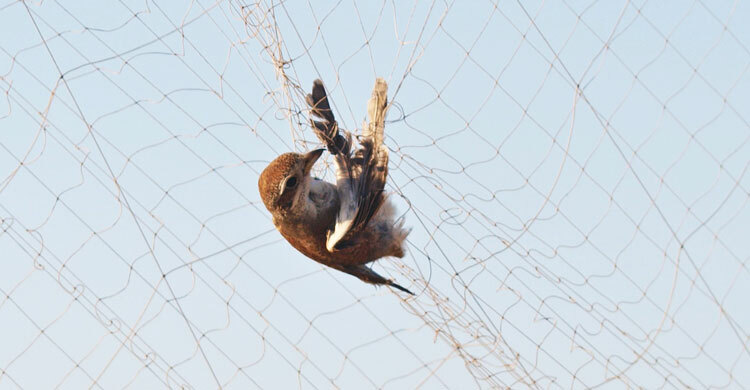 Efforts to address illegal and unsustainable legal bird trapping have to date been impeded by a lack of reliable statistics regarding its scope and scale, as well as a limited understanding of the social, economic and cultural importance of trapping itself amongst local communities. Many illegal activities have their roots in socio-economic aspects of countries, e.g. poverty of local people in rural communities and a long-standing tradition of bird trapping. In order to better understand the drivers underlying practices in Egypt, Nature Conservation Egypt (NCE) in cooperation with BirdLife International has recently conducted a socio-economic survey on bird hunting along the country's Mediterranean coast. According to the study, bird hunting represents an important source of revenue and livelihood for some coastal communities - suggesting that major changes in policies in favour of conservation have the potential to cause substantial impacts to individuals and families. The poorer communities are vulnerable to change due to their dependency on bird hunting as an income supplement and source of protein. Some coastal communities have traditional attitudes towards conservation based on maintaining a sustainable supply of resources, such as restricting hunting during the spring to allow birds to return to Europe and come back ‘with their children’ in the next autumn. Bird hunting is a long-established cultural activity in Egypt and hunters have acquired knowledge of migratory birds over many years. Hunting of birds may therefore be critical to the identity of certain communities and any changes to this activity could have more serious cultural impacts. It is important to find alternative livelihoods that help the communities to gradually switch from bird trapping to other economic activities. Combating environmental crime is currently not effective, as the wide range of relevant stakeholders do not work and cooperate in a coordinated manner. Not only the specialized units of each country, but also the cooperation and coordination with international organizations and initiatives should be greatly enhanced and improved. To achieve this, there is a clear need for coordination and cooperation in assisting countries in their enforcement activities and the enhancement of their enforcement capabilities. To address this need, an Intergovernmental Task Force on Illegal Killing, Taking and Trade of Migratory Birds in the Mediterranean (MIKT) has been created and will meet for the first time from 12 to 15 July 2016 in Cairo. This group is made up of government representatives of countries bordering the Mediterranean, international organizations, legal networks, hunting organizations and NGOs. The Task Force was created by a Resolution adopted at the Conference of Parties of the Convention on Migratory Species (CMS) in Quito in 2014. The Task Force aims to be a practical tool that will assist countries to take priority actions to reduce or eliminate the problem of illegal killing under a zero tolerance approach. It will facilitate international cooperation at the regional level in order to address this problem by bringing together all stakeholders including those organizations that are also addressing wildlife crime at an international level. The Task Force will identify the main hotspots across the Mediterranean and design adapted measures including better enforcement of legislation and increased penalties. Research and data gathering will be key to better understanding the socio-economic drivers of trapping and to establish its impact on the species affected all along their flyway. A monitoring protocol to measure the trends of the illegal killing as well as measures to raise awareness among local communities and the general public will be high on the agenda. These projects and activities will be packaged in a Programme of Work (POW) that will be the Task Force’s roadmap for the period up to 2020. A participatory approach will look for the integration of the hunters as part of the solution to the problem. Alternative livelihoods for those communities that depend on the hunting for subsistence will be explored, although those are a minority in the Mediterranean. It is expected that the Task Force will establish an efficient network of likeminded organizations and will be able to help countries address illegal activities and ensure the sustainable use of many bird species that yearly migrate across the Mediterranean. MIKT will take its first steps in a couple of days in Cairo, and already concerns about the upcoming migration season are being raised: will things move fast enough to save birds migrating over the Mediterranean between August and November? If international cooperation is key but needs time to bear fruit, could some direct concrete actions in Egypt possibly help save millions of birds in just a couple of weeks? Better surveillance alone could already make the difference and a commitment is needed to allocate more rangers at the hotspots on the coast, and to ensure a better control of the illegal activities. But other stakeholders also have a role to play. The NGOs and the hunters' associations have a direct impact on the ground, and are best placed to make illegal hunters and local communities aware of the incommensurable harm they are causing – often to themselves. This would be a first step towards a real change – bringing together a wide community of committed actors to halt the illegal killing, taking and trade of migratory birds.